As has historically been the case with a lot of things, the Canadian music industry was slow to recognize hip-hop. During the 1980s, there were hip-hop communities flourishing all over the country, particularly in cities like Montreal, Halifax and Toronto. Artists like Michie Mee, Devon, HDV, MCJ and Cool G, Dream Warriors, and Get Loose Crew, among countless others, were actively shaping the sound of Canadian hip-hop. But, it really wasn’t until a kid from Scarborough who went by the name Maestro Fresh Wes broke out, that the wider Canadian music community started to take notice. What they did have was the unwavering support of radio DJ and “Godfather of Toronto hip-hop” Ron Nelson, who launched the country’s first hip-hop exclusive program Fantastic Voyage on CKLN-FM in 1983, and the attention of a budding national music television network called MuchMusic. “When I started to shop my demo tape, the industry was looking for MCs like Bobby Brown from an R&B/mainstream perspective, and Fresh Prince” recalls Wes. “I respected those cats but that wasn’t really my style. I knew those guys were good, but I thought I was good too, and I learned from a young age that my community thought I was good thanks to the support of guys like Ron who gave me that encouragement from the time I was 15-years-old. While Wes got his start as a member of Toronto duo Vision Crew, which he co-founded alongside Ebony MC, he broke onto the international stage as a solo artist after famed American singer and dance producer Stevie B took notice of him following a performance on MuchMusic’s Electric Circus. “Vision was me and Ebony MC for a few years,” says Wes. “We did several shows, opened for guys like the Beastie Boys, and that was really about representing that Toronto sound as I said. We had that energy to be the best and that was indicative of what was going on here during that era. Wes approached his producers at the time, Peter & Anthony Davis, and pitched them on the idea. What they came up with ultimately changed the face of Canadian hip-hop indefinitely. Built around samples of “The Champ” by The Mohawks, “Funky Drummer” by James Brown, “Set It Off” by Strafe, “La Di Da Di” by Doug E. Fresh and Slick Rick, “One, Two, Three” by The B-Boys and “Rebel Without a Pause” by Public Enemy, “Let Your Backbone Slide” would eventually appear on Wes’ landmark 1989 debut, Symphony In Effect, which became the first Canadian hip-hop album to be certified Platinum. The song also turned Wes into the first Canadian hip-hop artist to have a stronghold on Billboard’s Top 20 Rap Singles chart and the first Canadian hip-hop artist to have a single reach Gold status. “The album came out and it completely changed the musical climate of Toronto,” says Wes. “Suddenly people were negotiating deals and all kinds of different artists were getting signed to major labels. A lot of that had to do with the success of my album. It definitely put a battery in the back of the nation as far as Canadian hip-hop went. “Let Your Backbone Slide” also went on to win the first-ever JUNO Award for Best Rap Recording of The Year––a category established as a direct extension of the song’s success––while the video, which featured Wes in his signature maestro tux with tails, was awarded a JUNO for Best Video of The Year in 1991. “As it turned out, we didn’t just make a record we made history and that was a beautiful thing,” says Wes. “I was just that guy at that particular time and we collectively had a movement. By we, I mean the other artists that came out at the same time and the sound crews that came out before I did. We were making records now and we had this machine called MuchMusic and everybody was excited. We were doing something, and we were on the cusp of something that could change our nation. That made us trailblazers for a whole new generation of artists on the come up, and I’m very proud of that,” he adds. 30 years on from its initial release, “Let Your Backbone Slide” is today regarded as a seminal recording of late ‘80s hip-hop. The song’s success not only opened the floodgates for hip-hop to be taken seriously at home here in Canada, but became the platform upon which current Canadian hip-hop artists such as Drake, The Weeknd, PARTYNEXTDOOR, Majid Jordan, Jazz Cartier, Tory Lanez and countless others have since found both mainstream success and critical acclaim on the world stage. “When you look at rock artists like Leonard Cohen, Gord Downie––rest in peace to them both––Bryan Adams, Neil Young, Rush, these are the elder statesmen of Canadian music and they’re all revered,” says Wes. “When it comes to hip-hop, yes, a lot of it has been documented, but we need to be celebrating what’s been accomplished in the same way rock acts do. 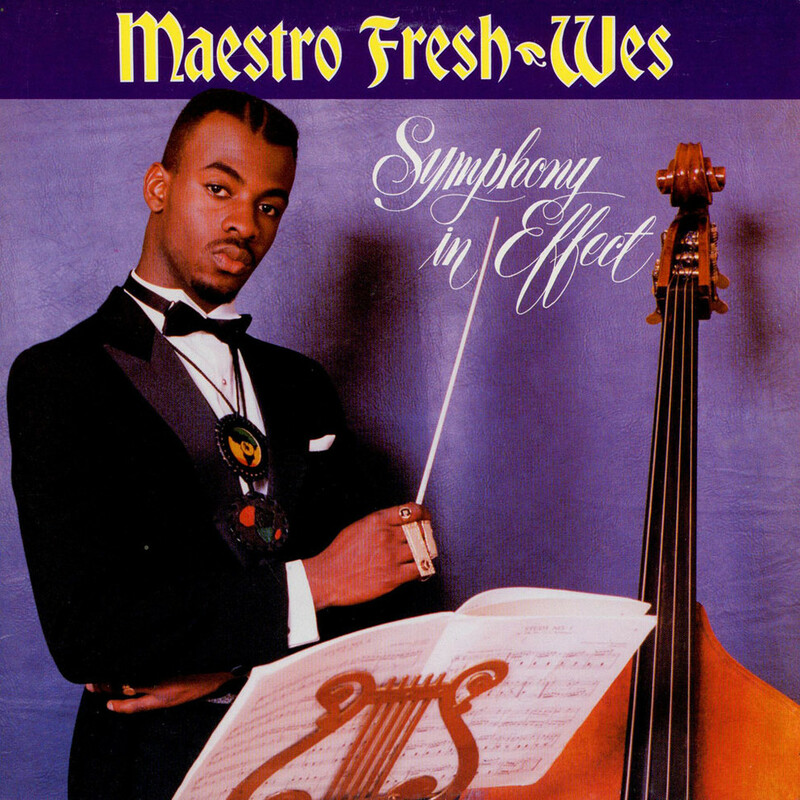 Maestro Fresh Wes is widely considered to be the Godfather of Canadian hip-hop. He is a 14-time JUNO Award nominee, an inductee to the Scarborough Walk of Fame, the author of motivational book, “Stick To Your Vision,” and is widely known for his role as popular teacher Paul Dwyer on CBC hit sitcom, Mr. D.
In honour of the 30th anniversary of both Symphony In Effect and “Let Your Backbone Slide,” Wes dropped a brand new album, Champagne Campaign, on March 8th, 2019. The album is available HERE.